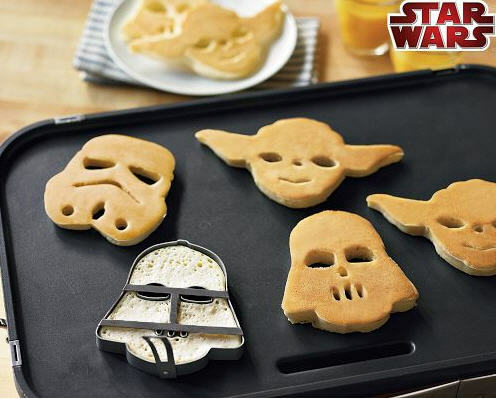 Please give me some money because it is a downright shame that I have had to live my life up until now without these, and to ask me to continue to lead this empty, Star Wars pancake mold-less life is a crime against humanity. A long time ago in a galaxy far, far away, a Jedi Kitchen Master created an epic breakfast to unleash the power of his Jedi Padawan. Using the Force™, he created three nonstick steel pancake molds in honor of his favorite galactic heroes and villains: Yoda™, Darth Vader™ and a stormtrooper™. Our Star Wars molds couldn’t be easier to use. Just place them with their handles up on a preheated griddle then pour in your batter. After the first side has set, remove the molds and flip the pancakes. Serve a stack drenched in your favorite syrup – and let the adventures begin. Hand-wash. 4 1/2″ to 7 3/4” wide. Fold-down handles. Set of three. 77 of 89(87%)customers would recommend this product to a friend. Give us feedback about this page. I may also need a pancake pen. This entry was posted on August 13, 2010 at 2:33 am and is filed under Buy Me This!, Uncategorized. You can follow any responses to this entry through the RSS 2.0 feed. You can leave a response, or trackback from your own site.